Performance of the TAP or any other low temperature heat driven thermo acoustic system like the thermo acoustic solar cooler depends heavily on the available input temperature and the temperature at which heat can be rejected. This is due to the second law of thermodynamics, which state that the theoretical amount of heat that can be converted is proportional with the temperature difference supplied. To show this dependency an simulation is made for the TAP. With the left side slider input temperature can be set between ambient and 160°C. 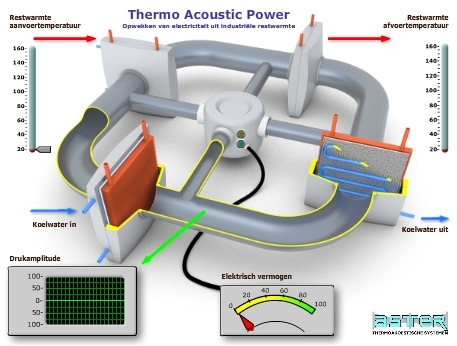 Above about 60°C oscillation will start and at 85°C temperature the acoustic power level is high enough to switch on the counterbalanced alternators in the middle for converting acoustic output power of each engine stage into electricity. Full electric output power is reached at 160°C heat input temperature.